This application is awsome. The public is finally able to get a close view of our changing planet over different time periods. 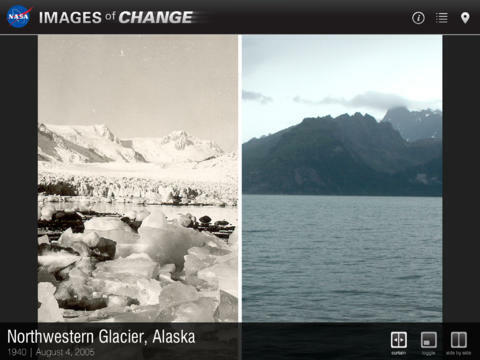 The great selection of Nasa Global Climate Change pair images (constantly updated) show area that have been subject to natural disaster or seen significant change over time caused by human activities or consequences of climate change. The pair images are accessible directly along with related information and on an interactive world map. The user can also share the app via mail and social media. A web version is also available here.